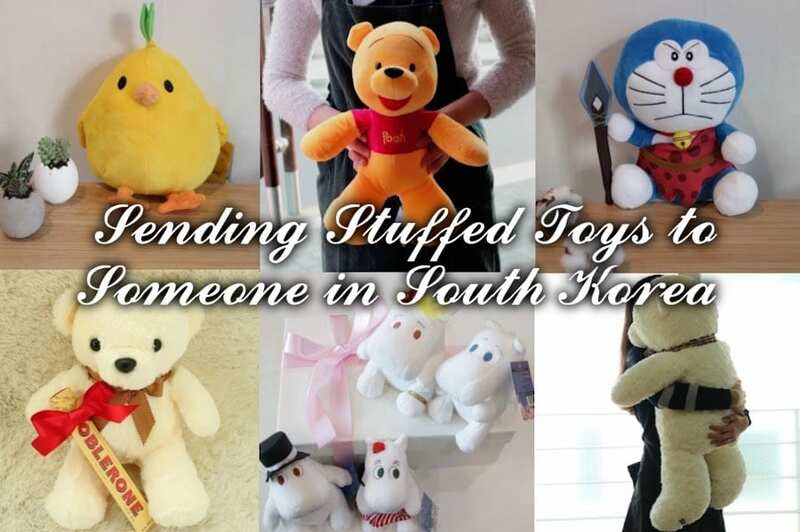 People have been sending stuffed toys to their friends, family members, and favorite Kpop celebrities. People usually send a stuffed toy as an add-on gift when ordering a gift for their loved ones in South Korea, but some people just send a teddy bear or a stuffed toy character to their friend in South Korea. Each order comes with a FREE message card that will be sent along with the stuffed toy you order. You can write out the message when you finish adding all of the items to your cart and “checkout”. 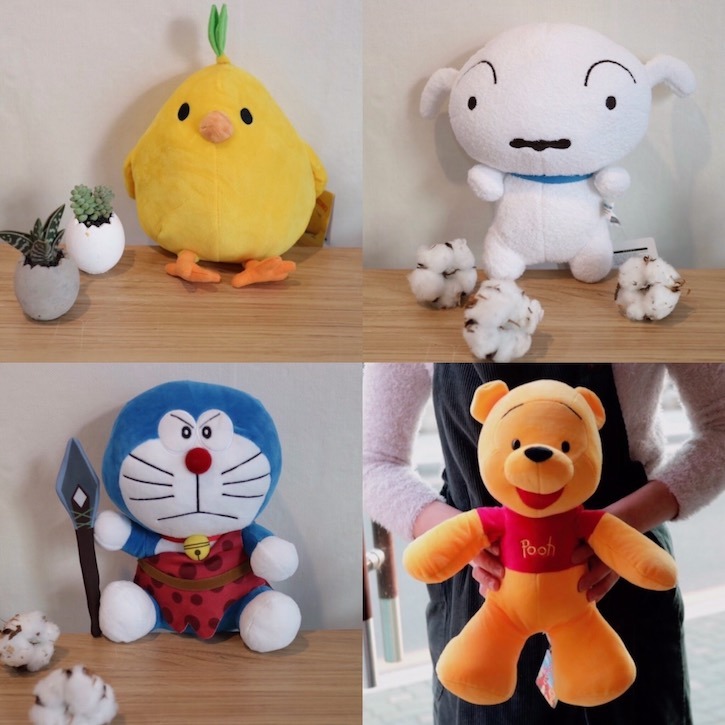 The one in the top left is called, “Cute Chick”, the one beside it on the right is “Shiro”, the one in the bottom right is “Winnie the Pooh”, and the stuffed toy at the bottom left is “Doraemon”. 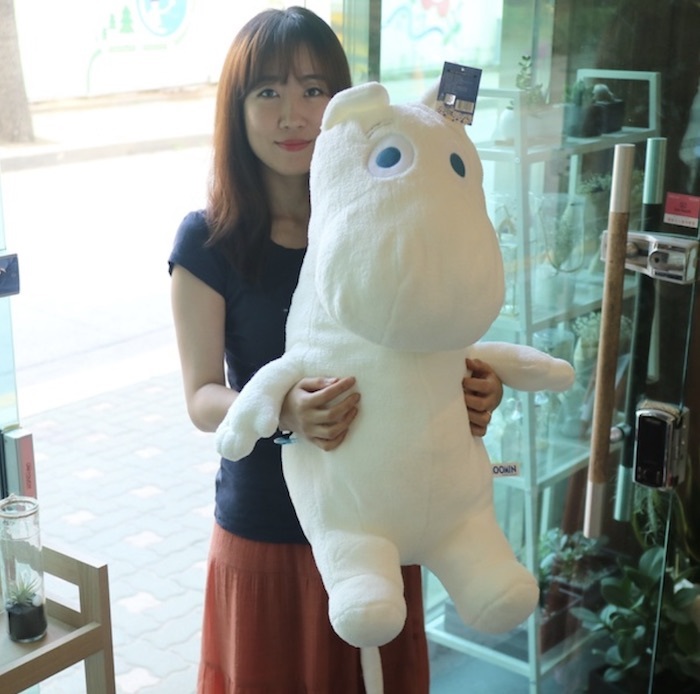 We also have some big stuffed toys for those of you who want to really surprise your loved one in South Korea. Here are two of the bigger stuffed toys. So you can send a normal sized stuffed toy or a large sized stuffed toy to almost any address in South Korea with Flower Gift Korea. Some people know that it is a good idea to send a stuffed toy when sending a flower bouquet. It’s always a bonus for the recipient to receive a stuffed toy with a flower bouquet. Flowers are beautiful, but stuffed toys can last for a very long time. Here is a photo of one of our stuffed toys that was sent with a flower bouquet. We also have a few sets that come with a stuffed toy. 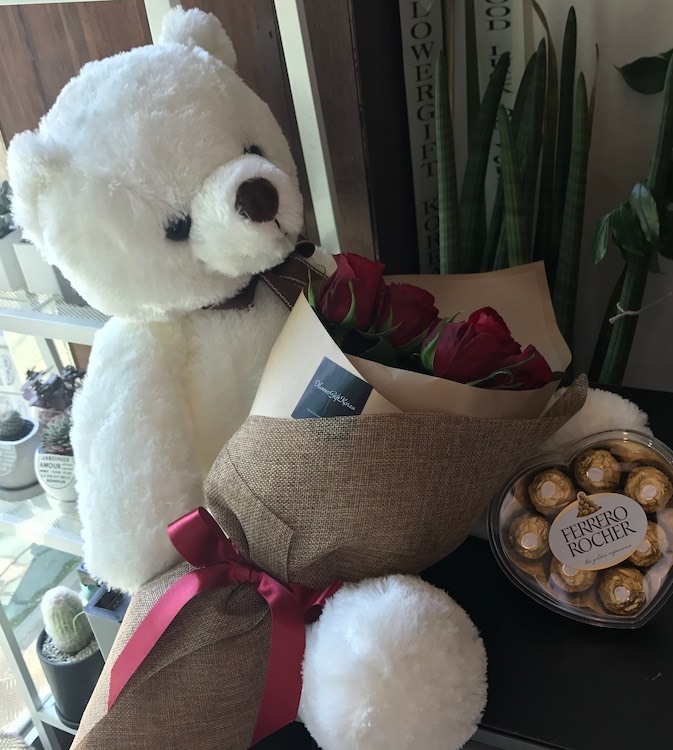 The set below is one of our most popular purchases, which is a bouquet of roses, a semi-large stuffed toy, and some chocolates. 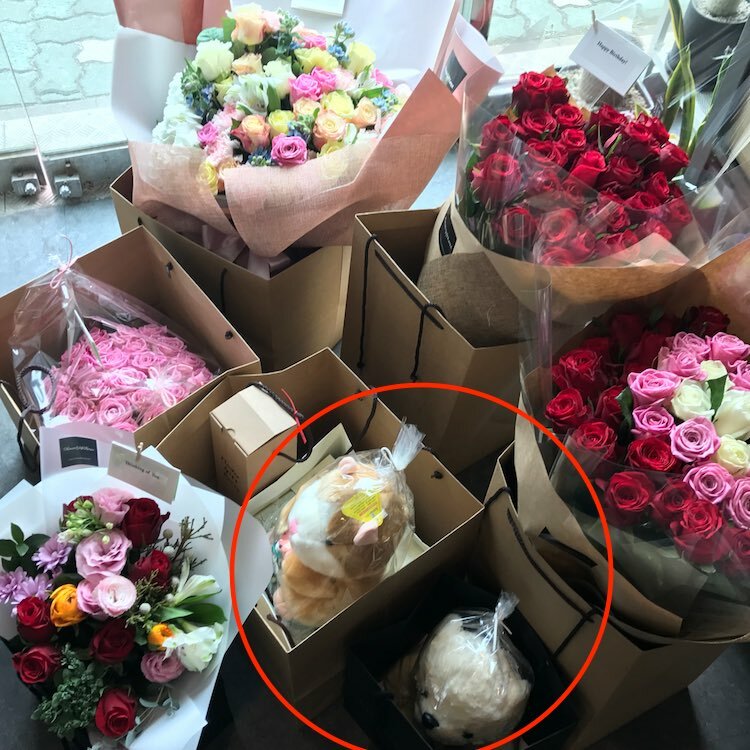 And below you can see a stuffed toy among a bunch of flowers deliveries. The stuffed toy was sent with one of the flower bouquets. The large moomin was delivered with one of the wines and a large flower bouquet! The sender was really thoughtful and truly knew how to spoil his girlfriend in South Korea. Also, if you haven’t noticed, most people do not send a stuffed toy with a flower bouquet. We at Flower Gift Korea believe that it is better to send something with the flowers to make the gift receiving experience that much more special. Receiving a flower is wonderful, but receiving a stuffed toy with a flower seems like such a bonus. But even just receiving one stuffed toy is awesome. 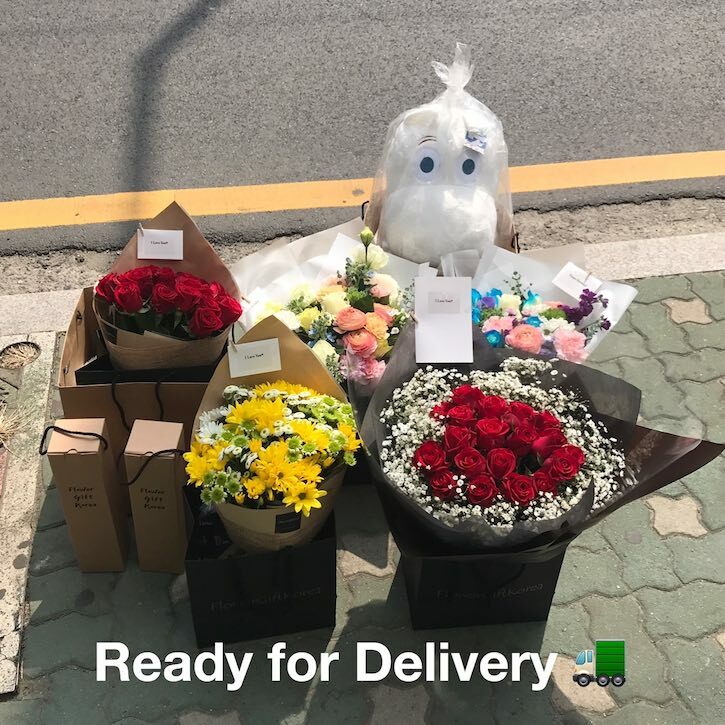 Some people also send stuffed toys to celebrities, though most people send a flower and a stuffed toy when sending gifts to their favourite celebrities in Seoul South Korea and nearby. 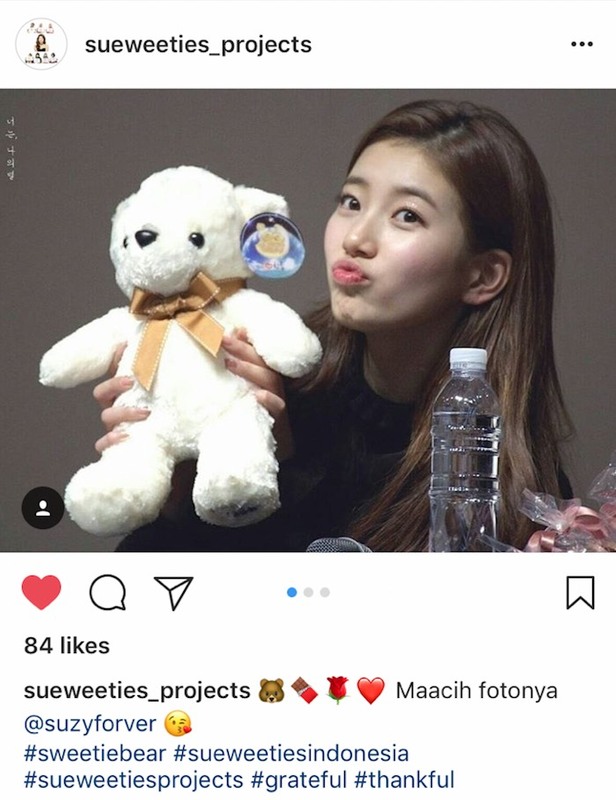 The above photo is a screenshot of an Instagram post that is of Suzy Bae posing with our cutie pie stuffed toy! So it’s always a good idea to send a stuffed toys with the flowers you send to your favourite Kpop idol or Actor or Actress in South Korea. To view more of our stuffed toys, please click here or go to our “Other Gifts” section.